The Stanley Cup hangover, you hear it every season. People believe the defending Stanley Cup Champions will always suffer from slow starts to their title defending season. It may be the short off-season, the excessive partying and parades over that time, or the extra focus on your team because of the win, blame it on what you want, this phenomena shows it's face every season. This year the Los Angeles Kings got bit by the bug. The Kings opened the season with a 5-2 loss to the Chicago Blackhawks, the game that ultimately started the Blackhawks' historic run, a game that the Kings looked out of sync and a step behind their competition. The Kings went through their first ten games of the season with a 3-5-2 record, and sat well outside the playoff picture. The Kings' defense and goaltending, an aspect of their game that played a big role in their playoff success last spring, seemed shaky at times. Defensemen were missing assignments and soft goals were finding their way through the pads of the Kings' goalies. Fans found themselves in a familiar spot, cheering on a team that could not find the back of the net. In their first ten games, the Kings scored two or fewer goals in six of those games, including a shutout loss to the Nashville Predators. However, it seems the Kings may have recovered from the bug that ailed them early in the season. Since their first ten games, they have gone 10-3-0 and looked like a team poised to make another run at the Cup. Of late, The Kings have sobered up from their hangover and remembered how to light the lamp. They have scored three or more goals in 12 games this season, and have eclipsed the five goal mark five times. In fact, the Kings have averaged just under six goals a game in their last three wins. Jeff Carter is perhaps the biggest factor in the Kings' recent offensive explosion. 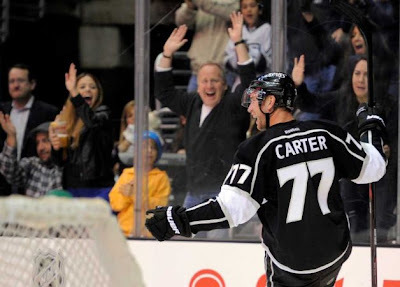 Carter has scored 12 goals in his last 12 games, including a hat-trick on March 4th, and sits in second place in the NHL in goals, with a total of 17. The Kings have recieved offensive production from the usual suspects as well, Anze Kopitar leads the team with 22 points, Carter's line mate, Mike Richards has pulled in 17 points, and defensemen, Slava Voynov has blossomed into an offensive force and has recorded 16 points. On top of their offensive explosion, the Kings have moved back towards the aggressive tight checking defense they were known for last season. With veterans Matt Greene and Willie Mitchell out with long term injuries, the Kings front office brought in Keaton Ellerby, and young players like Drew Doughty and Alec Martinez have developed into minute eating work horses. While it may seem like the Kings are back they are still not firing on all cylinders. Their goaltending, although good, has not been what is was. Starter, Jonathan Quick, has looked off at times which could be attributed to his offseason back surgery, but back up Jonathan Bernier has been strong and has gone 5-1 in his six starts this season. Since the lockout-shotened season is just past the half way point, it is a good time for the Kings to click and get moving. At the time of this post, the Kings sit in fourth place in the Western Conference. But, only two points separate them from eleventh place. The Kings will need to keep up this pace and possibly find another level to keep up in the competitive Western Conference. But, for now it is safe to say the Kings have gotten out of that early season slump, have last year's championship in the rear view mirror and are looking forward to this year's title.